I went through three changes of clothes through the day as it was raining hard and I got very wet. The crew was scattered over the work site under tarps and cover. A lot of wiring got done and painting too where it was possible. 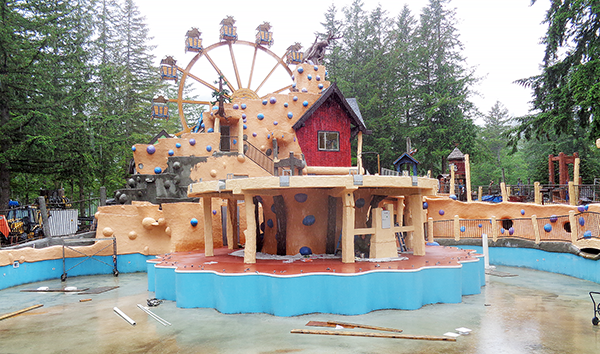 The caves in the Wilderness Adventure got their first coat of paint. They changed in an instant from a dark and dreary place into a wonderful and colorful underground journey. Kids are going to love exploring this place! A number of the large vertical timbers around the bumper boats got their final coat of glaze today. As eash one was completed the timbers suddendly jumped out from the colorful dirt banks they hold up. There is still a couple of days' work to complete this area but it is looking really good already! We completed the last of the welding on the frames for the gold and gems panning attraction in the Wilderness Adventure today. Matt and TJ got a good jump on the meshing and on Monday or Tuesday we will finish off the concrete work in this area. I loaded and delivered the last of the prefabricated pieces today, save for the signs which will go on the buildings. It is very exciting to watch our ten month project starting to come together at last.